Flank (Skirt) Steak is a cut from the abdominal muscles of the cow, it could be a rather tough meat. By cutting it thin and possibly braising, wonderful flavors can be coaxed into revealing themselves. Brasciola is rolled beef, stuffed with simple ingredients and braised. It’s a fantastic side meat to be served with Sunday Gravy. Brasciola is prepared by rolling the meat around stuffing held together by tooth picks or string. Note: After a talking with our butcher, it was suggested we try a new cut of meat called ‘Claude Petite Tender.’ It’s commonly referred as Petite Tender or Shoulder Tender. It’s a cut that is from one of the most tender muscles and is of similar quality as fillet mignon but less expensive. The only provision was that I do not cook it too long! One thing you do need to do is get it prepared properly, the slices of meat should measure +/- 6×6-inch and flattened. 1. Roll and pound beef steaks flat as possible (or ask your butcher to prep it for you). 3. Spread layer of seasoned bread crumbs. 4. Roll meat with the filling of your choice (see list of suggestions above); use toothpicks to hold it together. Place seared braciole in baking pan on top of layer of ‘gravy.’ On low temperature (250F-300F), using pan filled with Sunday Gravy, immerse seared Braciole. Cover and let cook for about an hour. 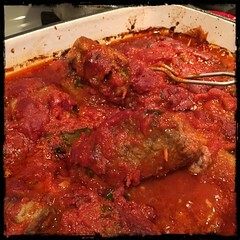 On low temperature immerse seared Braciole in Sunday Gravy and let stew for 45-min to and hour. Add to Sunday gravy when sufficiently browned. Let simmer in gravy for at least 45-min to 1 hour. And that was many years ago but I could never find pork sliced so thin. I’m surprised, you can’t get pork cutlets? Maybe you can ask your butcher?